PSM is a small, friendly driving school, offering Pass Plus accredited driving lessons in and around Kettering, Corby, Wellingborough, Rothwell, Desborough and neighbouring villages. For over eight years, PSM's founder, Paul Millen, has been successfully teaching people of all ages to drive. Because he is a particularly patient person, you can be comfortable learning to drive and building up all the skills you need at your own pace. Once you have passed your test, Paul offers registered Pass Plus tuition which not only gives you extra driving skills, but should also substantially reduce your insurance premiums. More importantly, Pass Plus helps cut the substanital risk you face, as a new driver, of having a car accident. It enhances your skills so you are capable of driving more safely and with well-founded confidence on all kinds of roads, from narrow country lanes to busy motorways. 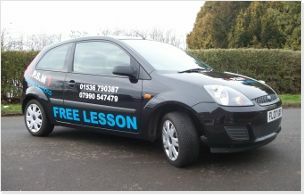 Find out how to claim your free driving lesson or contact us to discuss your best path to a pass.